Yesterday I completed what I promised to do when I applied for and got a Manitoba Arts Council grant last fall – and only one day beyond the five months (December through April) I’d projected! What I promised was a “near final draft” of [tentative name], a novel in which [one sentence description]. It exists now, a manuscript of some 114,000 words, and needs a rest. As do I, to take some distance so I can see what “final” may involve, and to gather energy for the steps beyond that, which include others deciding what I’ve got and if it’s any good. In the meanwhile, I’m deeply grateful to MAC for the financial support and affirmation, and for the powerful motivation that external expectation provides! In the weeks just past, I’ve also been celebrating finished books – by others! The Manitoba Book Awards happened Saturday, April 28. I couldn’t help reminiscing about the same event a year ago, the held-breath of waiting as nominees are listed, the envelope opened, and the gasp and excitement of hearing my name. I was much calmer this year, with nothing in the running, but still, it’s the kind of gala event that generates good tension and lots of fun, and this year was no exception. Warm congratulations to all the nominees and winners, among whom I want to mention in particular Miriam Rudolph, winner of the Best Illustrated Book of the Year Award for David’s Trip to Paraguay (CMU Press), a children’s book (you can read about it and view more of her delightfully evocative work here), and Sue Sorensen, winner of the Eileen McTavish Sykes Award for Best First Book for A Large Harmonium (Coteau Books), which the jurors called “a funny, intelligent, touching book” (and I agree). The tourist/poet searches, yes, longs to touch the objects on display, longing for what’s lost. The exhibit closes for the day. you step into the empty street and breathe the evening in. Shafts of light fall on the fountain, on tulips, beds of rue. Geraniums on the boulevard bloom bright as blood. 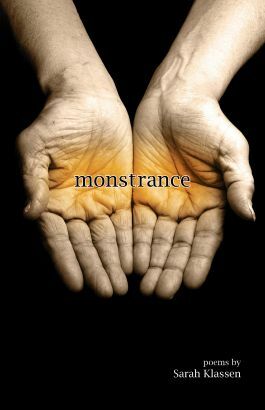 I’m very much looking forward to working my way through Monstrance, a poem or two a day, I think, to read what Sarah opens her hands to receive and then offers in the monstrance of her words. This entry was posted in Books, Writing and tagged Dora Dueck, J.R. Leveille, Manitoba Arts Council, Miriam Rudolph, Monstrance, Sarah Klassen, Speaking Volumes, Sue Sorensen by doradueck. Bookmark the permalink. Congratulations on finishing a near final draft in near record time, Dora. You are amazing. And the idea of letting it lie fallow for a while sounds like a good one also. I appreciated the “Monstrance” poem quotations also. You and Sarah have taught me a new word/image. Thanks so much Shirley, and so sorry too… just noticed now that while I thought this comment had gone through soon after you posted it, it obviously had not. I wish I could attend your reading on May 12th, but we will just have pulled in after a three day drive from Ontario. I remember last year we came back from the same drive and attended a book discussion of “This Hidden Thing” at Nighswanders on the evening of the day we arrived! Maybe I can make it work again . . . Thanks Elfrieda, I so appreciate your support, but by all means rest after a long drive!